We've all heard the phrase "dress for success." But there's no one-size-fits-all when it comes to the perfect work wardrobe. For a little sartorial inspiration, we've asked fashion industry entrepreneurs about professional looks that exude confidence. Born and raised in Toronto, Michelle’s love for fashion was fostered during her childhood. 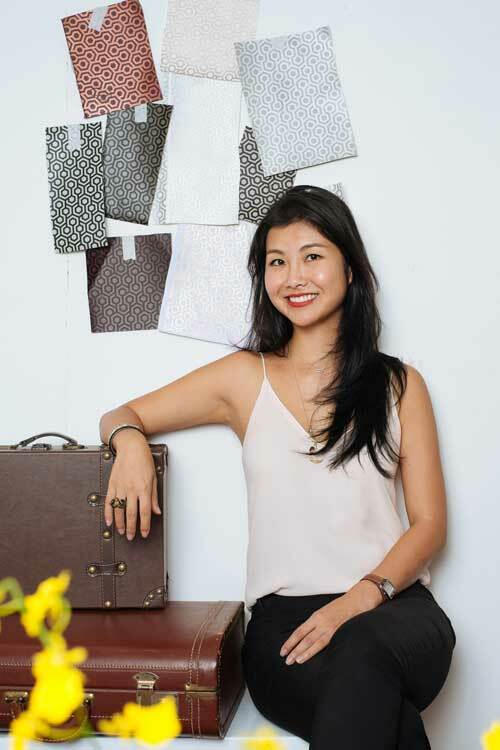 She founded handbag label Mischa in 2008 and has since been featured in publications like Forbes and Harper’s Bazaar. How do you typically dress for work? I'd say it's feminine and comfortable, as I'm running around a lot. I love to wear dresses because they're so effortless. I think they're stylish and professional. As with MISCHA, I'm inspired by travel. So my style changes depending where I've been. If I've been in Bali too long, I'll be in maxi dresses for a while. In the winter, my uniform is skinny jeans, button down shirt, boots and a long coat. What trends are you seeing in work fashion? Generally speaking, I think work fashion is becoming more casual. I'm very lucky; I can wear whatever I want as long as I'm well put together. In the creative industry, I think anything goes. My friends who work in corporate say they are more comfortable about wearing colours and feminine silhouettes. But there's still a definite gap in the market for chic and high-quality work wear. Who is your style icon when it comes to dressing for work? And why? I wear whatever I like, but I guess if I worked in corporate it would be Claire Underwood from House of Cards. I love tailoring and power dressing. In a creative realm, I really like Jeanne Damas, founder of Rouje for her effortless Parisian style. What are the must-haves in any work wardrobe? You never go wrong with a black dress -- and it doesn't have to be little. And ballerina flats in a zillion colours, of course. They're chic while still being so comfortable. Any local designers you love? Grana for their quality basics. PI'A for their take on the work shirt. Sarah Chessis is the entrepreneur behind digital fashion brand Isabella Wren. Using 3D technology, Isabella Wren is able to deliver a range of work apparel customized to fit your measurements. While it’s true there is a more casual attitude towards workwear in the younger generation, there's still a strong desire for clothes that are formal, beautiful, and powerful without being stifling and conformist. Apparel designers and retailers all over the world are trying to connect more effectively with their customers by providing products that are customisable and individualised. I think that the trend towards greater levels of individualisation is most certainly going to continue over the coming years. What does that mean for traditional office attire? Gone are the days of the traditional power suit for women. We are seeing more women executives in minimalist dresses but with signature jewellery that is special to her, or a bright silk blouse with an A-line skirt and striking knee-high boots. Both looks are simultaneously business-like in their approach but have individual elements to make the woman stand out and feel confident. Who is your style icon when it comes to dressing for work? Currently Amal Clooney, Queen Letizia of Spain and Sheryl Sandberg come to mind for different reasons. Amal Clooney has a great bit of flair and can pull off wonderful colours. Meanwhile, in Queen Letizia and Sheryl Sandberg, I see a great confidence in their presence and outfits. What are three must-have pieces in your work wardrobe? A jacket, a “go to” dress, and a perfect-fit blouse. The jacket is one of my favourite articles of clothing. It is so versatile, empowering, and can immediately make a statement. “Go to” dress in a core colour like black or navy. The one with the form fit that makes me look trim and terrific -- for me it must have clean lines and be uncomplicated. The blouse is where I can let my passion for colour and design come out. I love bright colours and patterns and, with such a blouse, I can take a conservative look and make it really pop. Any Hong Kong designers you love? I think Cynthia & Xiao is doing some interesting work. The design aesthetic appeals to me, as I really love bright colours and fabrics with texture. What's one accessory you don't leave home without? A seasoned stylist and consultant, Priscilla started her own styling agency Style Regime in 2011. Apart from styling big projects like Asia’s Next Top Model, she also spends time designing contemporary pieces for her own label PI’A. My personal work style is all about an interesting tailored jacket or modern shirt, and then a classic bottom such as dark denim or a well-cut trouser or skirt. This is a formula that can work for everyone. I almost always finish off the look with a red lipstick, because it really does give me confidence when I walk into a meeting; I think it's really key to look and feel confident and comfortable in any business scenario. I think the modern work wardrobe is a lot more experimental these days. There is plenty of interesting shirting out there to play with. Look for classic wardrobe items, with a little twist. These are pieces that will still be work-appropriate, without ever being boring. I love Vogue Australia's Christine Centenera for her ability to play with volume and silhouettes while always looking ultra-cool. I also love Vogue Paris' Emmanuelle Alt for her steadfast style-consistency (she really has a 'uniform' that she has worn for so many years); and Sarah Rutson, formerly of Net-a-Porter, for her tailored-chic aesthetic. What are your three must-have wardrobe staples? A white shirt with a little bit of a modern design twist; a pair of well-tailored, high-waisted black trousers that go with everything; and a matte red lipstick that you know won't budge. Melissa Bui for her whimsical feminine aesthetic; Christing C for all of my summer vacation wear; Vanessa Bell Jewellery for delicate and custom jewellery; and SAU for a special occasion. For me, it's always a killer lipstick. It can transform a T-shirt and jeans into something instantly chic. My work style is very simple. I like to wear denim jeans, a tee and sneakers to the atelier on most days as I like to be as comfortable as possible. I can't be designing when I'm feeling uncomfortable! Currently, modern shirting and checkered fabrics are being used in tailoring seem to be the trending designs in work fashion. I also love how the pantsuit is making a comeback! Giovanna Battaglia, of W Magazine. I love how simple chic her style is with a touch of drama. What are you top three must-have work wardrobe staples? A simple white shirt, a 50's styled A-line skirt and a pair of pointy-toe heels. Every woman needs a simple white shirt in their closet, as it goes with everything. The skirt adds a bit of flare to a more formal look and pointy-toe heels for added confidence. Any favourite places to shop in Hong Kong for business clothes? Other than the staples like Zara, COS and Club Monaco, I love shopping at Maje, Theory and Sandro! I love HK local brand P'IA for their modern approach to classic women's clothing. Their designs are so versatile that it's perfect for both work and for going out depending on how you style! My watch -- I'm just so used to checking the time on my wrist!